How do I import content from Common Cartridge into Canvas? You can import prior content from Common Cartridge into a Canvas course. 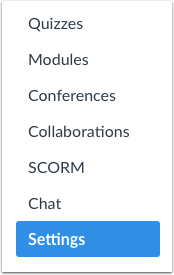 In the Content Type drop-down menu, select the Common Cartridge 1.x Package option. Find and click the Common Cartridge ZIP or IMSCC file you want to import . Then click the Open button . In the Default Question bank drop-down menu, select the Question bank you want to use for your question bank from Common Cartridge. To import assessment content created in Quizzes.Next, click the Import assessment content as Quizzes.Next option. Selecting this option will convert assessments in the import package to Quizzes.Next format. Note: You cannot select a default question bank when using the the Import assessment content as Quizzes.Next option. To overwrite the assessment content with matching IDs, click the Overwrite assessment content with match IDs checkbox. Previous Topic:How do I import content from Blackboard 6/7/8/9 into Canvas? Next Topic:How do I import content from Desire 2 Learn (D2L) into Canvas? 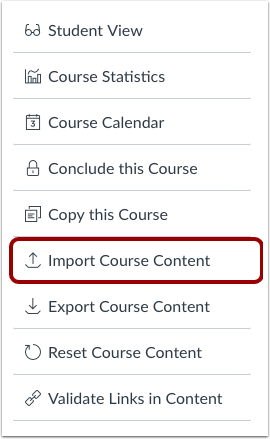 Table of Contents > Course Import Tool > How do I import content from Common Cartridge into Canvas? Re: How do I transfer content from a jenzabar test into a canvas test?